Christmas pudding, mince pies, Christmas cake: If you want a bit of something sweet at this time of year, it tends to come laden with dried fruit and often encased in pastry, with a dollop of boozy cream on the side. Those who hate dried fruit often find themselves loading up on chocolates instead when comes to dessert. However, if you wanted a non-chocolate or raisin-based pud, look no further than Denmark’s Risalamande. Traditionally served at Christmas, this is a Danish rice pudding complete with almonds, vanilla and whipped cream, with a warm cherry sauce on top. As in many Nordic countries, the big Christmas celebration in Denmark is on December 24, not December 25. After a dinner of roast pork or duck and potatoes, Risamalande will round off the meal. Also, among the chopped almonds in the bowl, there should be one whole one, and whoever finds it is the winner. Almonds might not be for everyone, but few will be able to resist Dutch festive favourite of Kerststol. 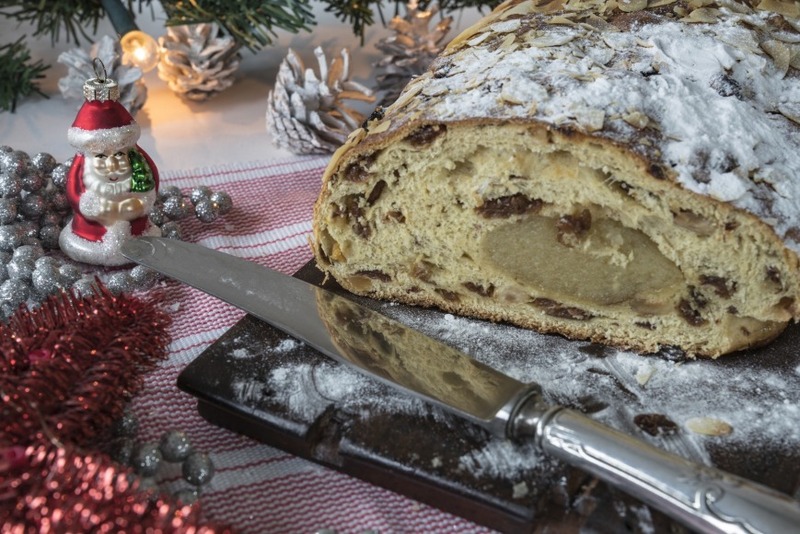 This is a sweet bread filled with dried fruit, raisins and Christmassy flavours, including vanilla, cinnamon, brandy and orange. Along with this, you could have a medley of chopped nuts, and every Kerststol has almond paste in the middle. With icing sugar dusted on top, when you slice through this loaf you’ll see all of the fruit as well as a circle of almond paste. All you need is a slathering of butter and you’re good to go. This is definitely one of the easier dishes to whip up. Heralding from Norway, it’s cloudberries mixed with whipped cream and sugar. Cloudberries might sound like something out of a Dr Seuss book, but they’re popular berries in Scandinavia – a golden yellow colour, they grow in the wild and thrive in cooler climates. Pair your multekrem with gløgg – Norway’s interpretation of mulled wine – and you’ll be sure to keep the cold at bay. Portugal’s Bolo rei, which literally translates as “king cake”, is a centrepiece fit for royalty. This is a sweet, soft white bread filled with raisins, nuts and crystallised fruit. What’s most noteworthy about the Bolo rei is its shape, which has to be a circle – almost like a crown. In Portugal you won’t just eat this dessert on Christmas day, but also right up until Epiphany on January 6 – which is known fittingly as ‘Kings’ Day’. In Mexico, buñuelos are a popular snack over the festive season. Many countries across Latin America have their own version, and Mexico’s are deep-fried dough circles that tend to have a hint of aniseed. These flat circles are rolled in icing sugar and cinnamon, and served with a hot syrup made out of piloncillo – unrefined cane sugar. If you’re looking to troll your kids this Christmas, you could do worse than take a leaf out of the Italians’ book. It’s tradition to fill children’s stockings with presents and sweets on the night of January 5, the night before Epiphany. When the kids wake up the next morning, they’ll find lumps of ‘coal’ in there – except it’s actually Carbone dolce, a type of sweet treat that looks just like coal. You can buy carbone dolce in Italy, but if you want to make it yourself, there are plenty of different recipes to try – the easiest of which simply involves mixing melted chocolate and puffed rice cereal and cutting it to look like coal.